No! Little two- and three-year-olds really are terrific, but they do have very strong needs for love and caring during this crucial stage of their lives. As their leader or teacher, you have the challenge of guiding these precious tots to learn of their heavenly Father and Jesus, their Savior. When a child is two years old, his intellectual ability, imagination, and curiosity are growing very quickly. He is trying to establish his own identity and independence, so he is apt to want to “strike out on his own” frequently. However, he often finds this is scary, and he cries or screams for the protection and comfort he received as a baby or young toddler. Honeybees for Jesus is a Bible club program written especially for twos and threes. Honeybees Bible Club provides many opportunities for children to have their own experiences in learning centers, crafts, games, snacks, and other activities, for precisely this reason. But the activities always take place with the loving care of adult leaders and helpers nearby to provide comfort and love when the child needs it. Two-year-olds especially are challenged by just about everything they experience; their self-confidence grows as they master simple tasks. For this reason, Honeybees for Jesus provides a wide range of learning activities, using many different methods, to challenge and teach the children about their heavenly Father and, in the process, build their self-confidence as they master important skills. 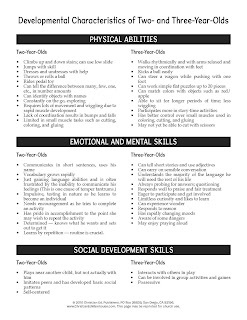 The chart below shows some important developmental characteristics of two- and three-year-olds. Because each child matures individually, and should be allowed to do so without pressure, children may show various characteristics earlier or later than the chart shows. The chart is provided simply as a basic guide to help you understand the child’s development in his third and fourth years of life. As a teacher of twos and threes, God has given you the very important responsibility of shaping young lives so they will grow up to love and serve Him. While twos and threes present important challenges for every teacher, they also provide unlimited delight and fulfillment as you watch these little lives grow in the knowledge of Jesus Christ. Welcome to the world of terrific twos and threes! Click on the chart to see the larger version.